I made this zone in 2009. Three stories that are officially NOT unpublished that I can’t sell, three poems, two from the 1990s and one original, and Vicki’s illustrations of my stories. If you want to read it, buy it with the Paypal link and I’ll mail it to you. It felt too guarded, and more than a little paranoid. This comment from a review of “Chicken” in an online writer’s workshop seems like an accidental compliment to me. I’d like to create a new genre called paranoid Horror, not dependent on gore or the supernatural (although those are allowed) but rather on the creepy sensation that the world is a much less friendly, more vicious place than our surface minds suppose from day to day.Why did I put my work in a zine? Some writers fear that any form of self-publishing dooms them in the real world. Well I can’t give into fear; what kind of storyteller would I be if I was afraid let my life become a story? Being a new writer is hard to explain to people. A zine is like a business card, and less pushy to show than an unpublished novel-length manuscript. How could I have a platform if no one I know has seen what I do? 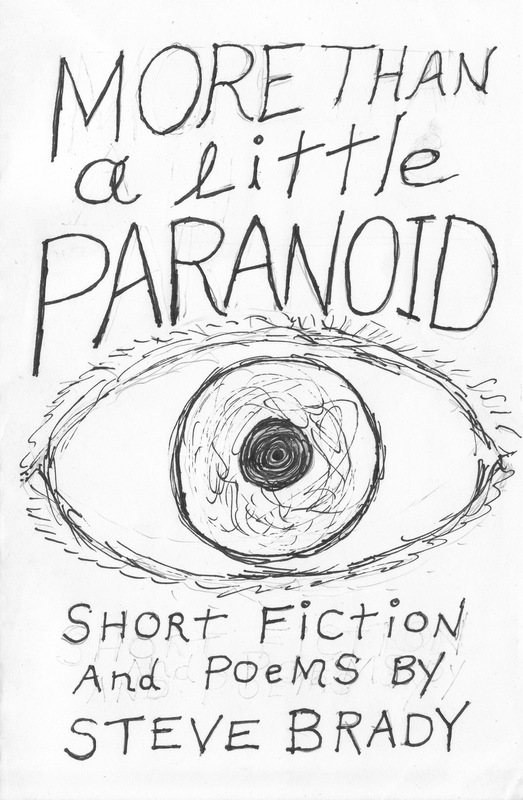 More Than a Little Paranoid costs $4 plus $1 for postage, envelope, and other complications.